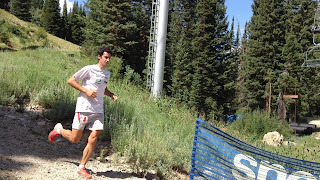 It really was fun to go down to see the finish of the Speedgoat 50K yesterday! 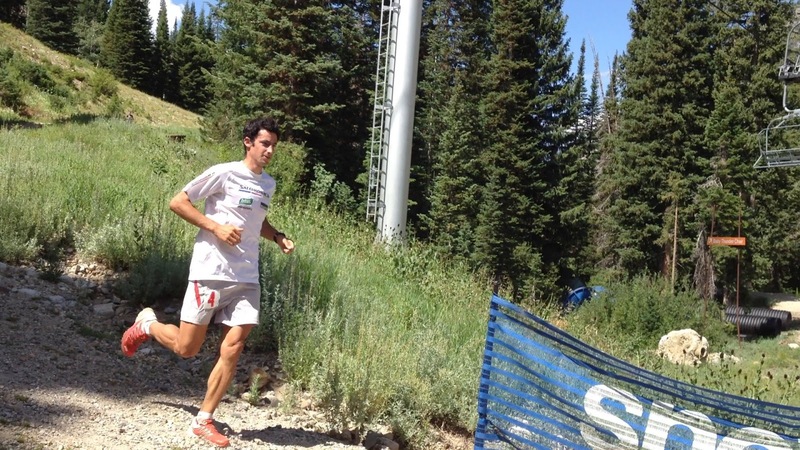 I was able to get a video of Kilian Jornet finishing the race and figured I'd put it up here. 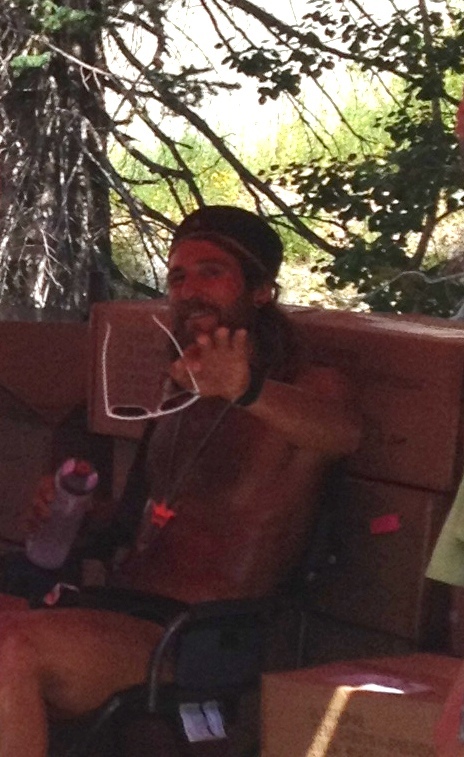 I enjoyed reading Tony Krupicka's account of the race. Even though my trail running will never be the same as pretty much ANYBODY who ran the Speedgoat, it's interesting to see similar experiences of overall crappiness followed by feeling pretty dang good even after long periods of not-so-good running. Actually I think he was explaining similar thoughts to what he wrote in that article, but I caught him right when it looked like he was gesturing at me to stop. Who knows, maybe he was! He was really nice to everybody there though. My brother got a video of 3rd (Max King) and 4th (TonyK) finishing - so I figured I'd throw that up here too! Cahoots is coming up in just under 2 weeks! 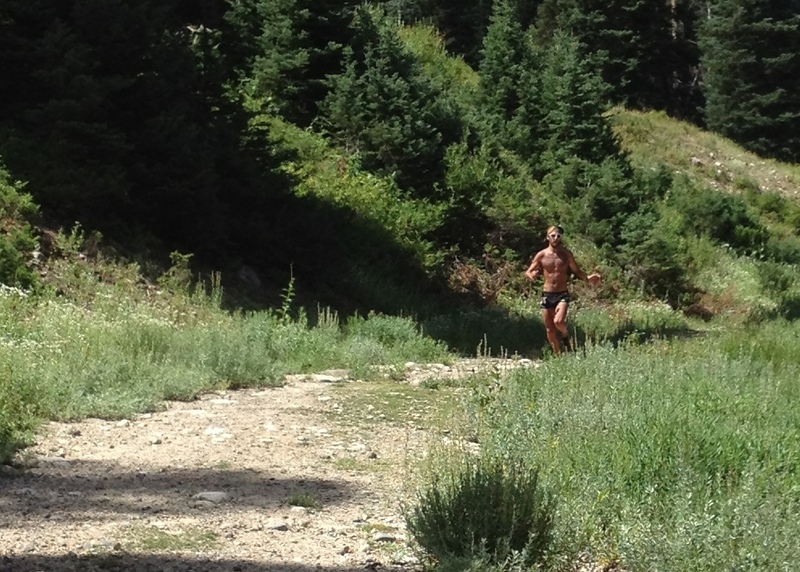 Speed Goat and almost 10,000 Feet Up! Family Reunion today up Big Cottonwood Canyon. Also happened to be the Speedgoat 50k over in Little Cottonwood Canyon being run by a bunch of the most elite ultra-runners in the world! So my dad and a couple of my brothers and a niece drove down to catch the finish. Pretty cool! 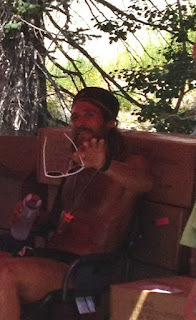 I was able to get a few pictures of some of the top runners coming in, it was cool to see Kilian Jornet and Anton Krupicka in person! Hey this shirt doesn't belong at this event! It was cool to see such amazing Athletes doing their thing and finishing this race! We had discussed going on a run in the morning before most of the Reunion stuff started, but with kids... that doesn't happen. I thought I was running late but we were one of the first families there! ANYWAY finally at about 3:45 we decided we could fit the planned 8-10 mile run in before dinner and the Evening program that I was in charge of with my brother. My dad decided to come along. That messed up our timing plans! We made it about halfway and realized that this was going to take a long time, and we were already LATE for the 6 o'clock program we were in charge of AND we'd missed helping with dinner again. So Matt and I left directions for my dad, my brother and brother-in-law, and we took off to finish the run. 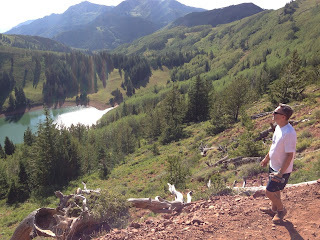 I ended up with almost 11 miles - a lot of it at ALMOST 10k elevation! I hope I'll get some of the pictures others got on this run, like me doing Mayurasana on a cool square rock of granite-type rock that was just in the middle of the road at the top of a peak, and cresting another hill... but for now here's one of me at about mile 4.5 almost 9900 elevation. Gorgeous views on this trail! My least favorite thing about Deck of Cards is that I don't have the exact number of reps that I did on which workout except for a few that I remember because they were not fun to do right in a row. Those burpees are always horribly timed! I got 3 rounds of high count (Jack (11) King (13) and Ace (15)) Renegade Rows and that was ROUGH. I started with 50# dumb bells because that is what my partner was using, then I dropped to 40, but after the 3rd or 4th round I dropped again to 30# and finished with that! We used a 35# kettlebell for the Russian Twists and 135# for the deadlifts. I think that's like the 3rd time I've EVER done Deadlifts. I think my form is all right but I could use some more work. Yesterday was ALMOST a rest day. I did pullups like normal, some ab work with L-sits and Full Ab Wheel Rollout practice - I'm getting closer to my full ab roll out goal! Around 7.2 miles up and back on Mueller Park. Really pushed it and made it up to Elephant Rock in 37 minutes. I know I could get up there faster eventually, but I am pretty happy with the amount of time it took me to get up there. FLEW down in about 22-24 minutes! Awesome run. One of the reasons I love the trail running we do is it is FUN. We push it hard and run fast - but we act silly and play around and take fun pictures! (I have a few more that were from Kakes' phone I'll have to put up later!) Here are some from mine! My brother and his wife - Our Running partners! After the run we played around on my Olympic Rings that I hung in my sister's tree. I might need something higher near my house to hang the rings on - my pull up bar isn't high enough to do some activities! Kakes practicing L-sits on Rings! HARD! Then we ate dinner (pulled pork and salad) and I ate WAY too much ice cream. Yum! After all the workouts I've had this past week - I'm TIRED! My body didn't want me to get out of bed and I was REALLY close to breaking my recently re-instituted "Don't Buy Mt. Dew" rule. So far I still haven't broken the rule. It's very hard today. An Awesome Workout by my Wife! Went to yoga at work today... nothing too special. It felt good to work through some of the kinks in my back, shoulders, and hips, but otherwise it wasn't particularly challenging or enlightening. We were kind of expecting to have a running night tonight but because it is a local holiday some (24th of July, Pioneer Day!) people were busy so we invited my sister and family over for a workout similar to the fun one I had on Saturday. Kakes decided she would put together the workout and she did a great job! She came up with 4 stations each with 4 workouts we could do in our backyard. Of course, I made sure to get pictures of this momentous occasion! Actually USING the stuff we've built and acquired for backyard workouts! I'm so impressed with us! Yeah... I'm pretty amazing, I mean I TAPED those papers to trees, fence posts, and square foot gardens. Talk about tough work!! Seriously though - props to Kakes for coming up with a great workout! We set a timer and did each workout at our station for 1 minute, then moved to the next station and continued until we had gone through all 16 workouts. First I recruited my 10 year old to take a few pictures of us during our first round... They turned out pretty blurry! But he got some good ones too. Then after we finished - I did a few more of the workouts so we could get some of the other workouts too! Okay, so I always have a weird face. Knee hops make me feel like I'm doing Insanity again! ...and the plank with baby-pose! So much fun!! Fly away little medicine ball! Fly AWAY!! The fabled Tire-head-man! Rare sight! Fun workout. I definitely look forward to doing these more often... and not just with the Tough Mudder guys, although I am looking forward to more of those too. 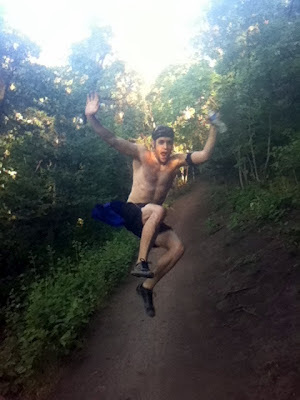 Kid's Pullup Bar, Bair Canyon, Tough Mudder Workout! Tuesday I decided it was time to get the kids post in for their pullup bar. I dug about half the hole that night while Kakes was at a baby shower. The kids 'helped'. Wednesday I finished digging and cemented the post in, and because the post was a bit warped from rainy days leaning against the house, I attached the bar to it as well, so it would dry and cure the way I wanted it to. 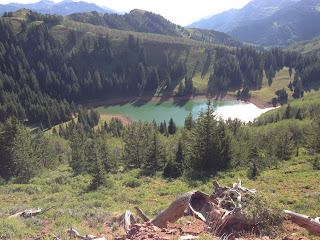 Thursday night we met for a Family running night - the girls did the Lagoon trail, we did Bair Canyon again. It's been a while! Just over 4 miles total - My GPS program that tracks my run has been acting up lately and NOT working correctly. Could be the program, could be the GPS. Who knows. I wish it'd work though! Friday at Crossfit we repeated "The Executive" workout that we did two weeks ago. Unfortunately somebody complained to the HR department about people taking off their shirts during crossfit workouts... so no more of that. It was HOT. I do much better when I can take my shirt off. Seriously. ANYWAY last time I did this workout in 15:06, this time I did it in 14:51! So I beat my last time by 15 seconds and got below 15 minutes yay! 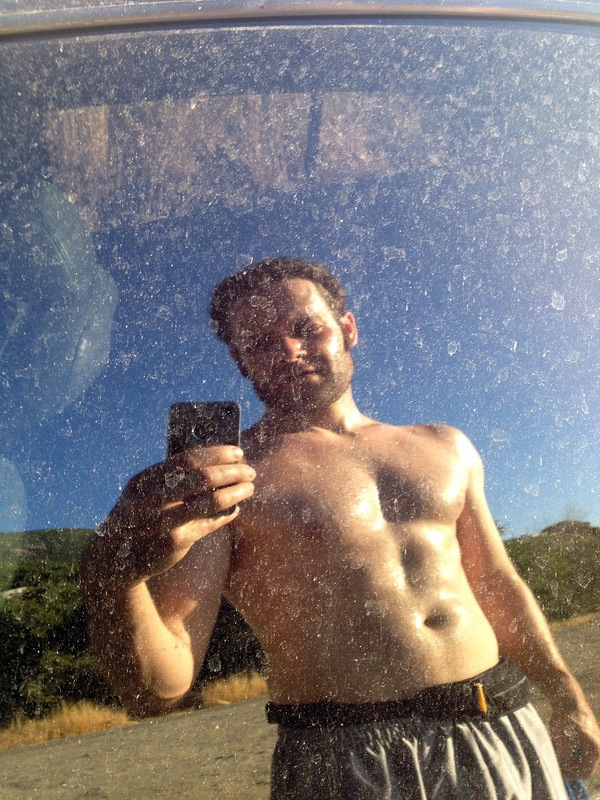 I think I could have been even faster had I been able to take my shirt off and sweat more freely. I'm completely serious about that too! 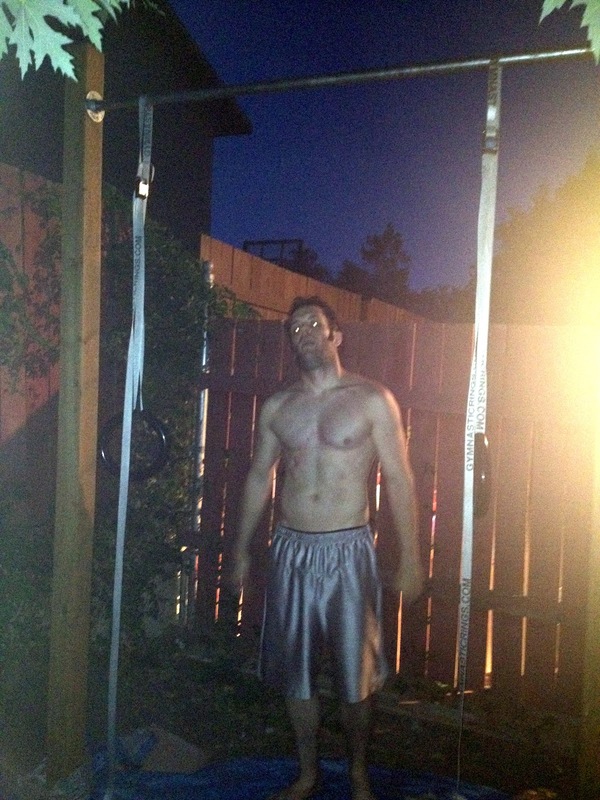 As a challenge after, we did Pullups and Dips. 15 body weight pullups and 20 body weight dips, then 10 pullups and 15 dips with a 10 lb plate, and finishing with 5 pullups and 10 dips with a 25 lb plate. I was able to do them all! For our second part we did a relay run/carry where one person starts and carries the kettlebell across the field runs back and brings the medicine ball, back and brings the sledge hammer, back and flips the tire across the field. That tire flip was the worst part of the workout! We did that twice. Good workout - I'm looking forward to our next one in two weeks! This morning I ran the Flag Rock run for our city's Festival Days. Last year it was billed as a 10k, but it's really more like 7.2 miles, so people complained and now they just call it the Flag Rock Trail race. I ended up finishing in 1 hour and 17 minutes, according to the 'official' results - 10th place! However I know there was a person or two ahead of me that didn't show up in the results - so we'll see what my real place was if they ever update that. My brother Matt took a wrong turn RIGHT at the end so he went an extra quarter mile and I finished 10 seconds after him! A few minutes after finishing with me bro. Look took me THREE HOURS! Muscle ups on my new bar have been improving and continuing! It's great! I bought some more cement so I could put the 3rd post in for the shorter kids bar - it should improve the stability of the whole thing! More Running! 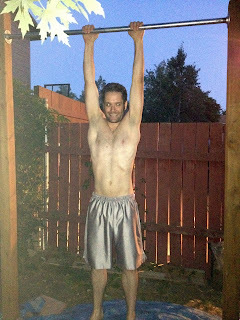 More Pullups! More Pictures! Saturday! 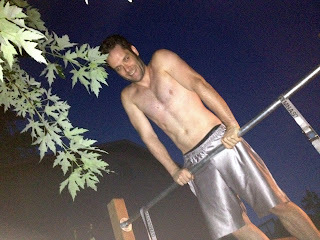 I finally tossed the fence posts in the holes and cemented them in, and I now have an outdoor pullup bar! Hooray! I like it a lot. So much that I took a few pictures of them while cementing and attaching the bar. Yeah we did a good job! I'm excited we got it in! Why did I come up here again?? Yay dirty car window reflection pics! After getting back, eating dinner, and watching the awesome American Ninja Warrior Finals, Stage 1, I decided to really put some use to my pullup bar. THAT's what I call 'real use'?! And I even did a few very-ugly muscle-ups. It's funny, but pretty much any time my beautiful wife is watching me I can't do muscle-ups well at ALL. If she's not around I can get up a couple of times in a decent fashion. Still need to work on smoothness and consistency of motion. I think the real problem is I always try to show her when I'm a bit tired! Need to work on that! All this has turned me into a zombie! BRAINS! Tuesday night (which feels like I should say 'Tonight' but really it's already Wednesday morning so I can't say that anymore!) we had Running night scheduled with the family. Mueller Park! That really is a great trail if you can avoid all the bikers. Not too easy, but not too hard. Challenging but by the end on the way back down you feel pretty dang good. We didn't go all the way to Elephant rock, making it 4.8ish miles with the extra trails I ran to not get TOO far ahead of the others. The best thing of these family running nights is the opportunity to sometimes run with my amazing wife. She is getting SO much stronger, SO fit and SO amazing. She's always been strong and amazing, but this FITness is fantastic! 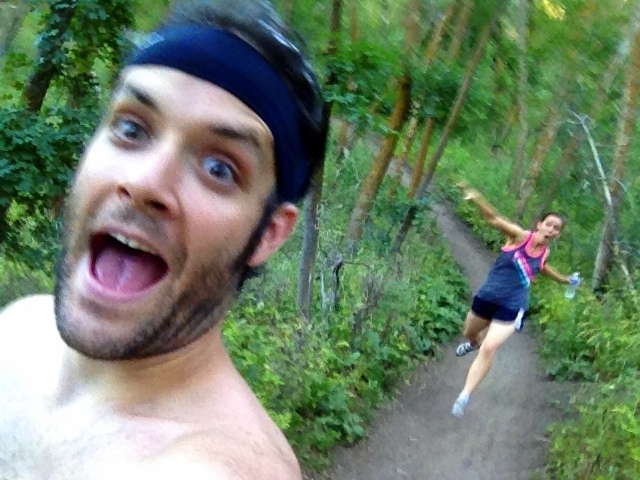 I also love taking pictures of our fun runs and hearing people comment on how happy and fit and fun we look. We do have fun. You can too! Next up? Leveling out the area below the pull up bar, adding a 3rd shorter post and bar so the kids can have a reachable area (and I can use it for various other exercises). THEN I'm going to add a 4th pole on the other side and hopefully I can figure out a good way to put an American Ninja warrior style SALMON LADDER there! So many possibilities! I'm still pretty slow on most hills! !